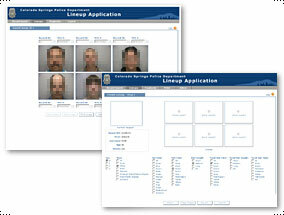 This On-line lineup application was designed with a very clean look branded under the Colorado Springs Police Department [CSPD]. This similar branding style was established in a previous Help Desk system we also designed and built for the CSPD. Information is presented in a logical and intuitive manner enabling users to quickly access search and report information.